Two people were injured and three others killed in a car accident Friday night in Palmdale. A 2013 Tesla collided with a 2004 Toyota Corolla. 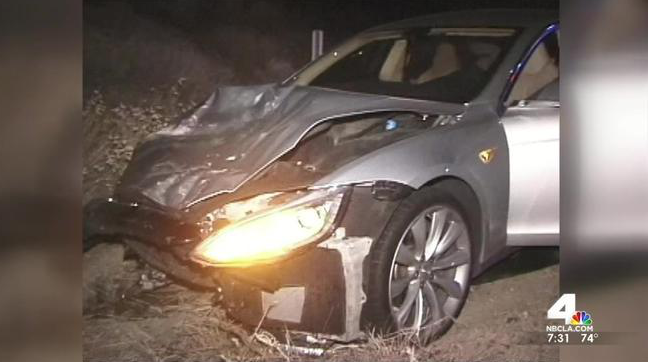 The crash occurred around 10:30 p.m. on the 14 Freeway near Avenue S. The Tesla rear-ended the Toyota. The Toyota was on fire when the California Highway Patrol arrived on the scene. The three people in the Toyota were entrapped and pronounced dead on arrival. Two others, believed to be a child and an adult, were taken to a nearby hospital. The 40-year-old male driver, 13-year-old boy and 8-year-old boy, all from Los Angeles, in the back seat were killed. Tyree Lavon Nash, 31-year-old resident of Lancaster, was transported to the hospital and sustained major injuries. A 6-year-old was taken to the hospital in critical condition. The passengers in the Toyota were wearing seatbelts. Bystanders assisted with removing the survivors from the burning vehicle. Ric Garrison, a 58-year-old man of Newhall, was the driver of the Tesla and only suffered minor injuries. There was no indication if drugs or alcohol were a factor in the crash. No charges have yet been filed against Garrison.